To the lef tare some pictures of the work we do. To view a larger image, click on any image you wish to see larger. When finishing my education in the mid 1970's, leaving school with an O level in metalwork, I joined Holland Holland for a five year apprentiship. 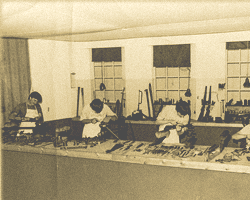 The first year was spent making the tools of the trade which also included a day release at college. During that first year I decided I wanted to be a barrel maker. The next four years were spent in the barrel shop learning all aspects of Barrel Making. After finishing my apprentiship I stayed at Holland Holland furthering my skills in Barrel Making. In 1983 I left Holland Holland and joined James Purdey Sons where I furthered my skills learning over unders and stayed there until 1985. I started my own Barrel Making Company when leaving purdeys and have since then traded under the name of London Barrel Maker. I specialise in making and repairing Shot Gun and Rifle Barrels, Side by Side and Over & Under in all sizes and lengths. I also specialise in making unique barrels which have included a pair of three barrelled side by side by side barrels and many big calibers. I have worked for some of the finest gunmakers in the world including James Purdey Sons, Boss, Holland Holland, Atkin Grant Lang, John Dickson Son, Hartmann Weiss, Peter Nelson, Wesley Richards. I am now passing on my skills to my son's James and Matthew and we all take great pride in the work we produce. We are members of the GTA and Gunmakers Livery.